If you were looking for the first boss in the DS version, see Globotron. Rotatatron, referred to as Big Boy by Dr. Eggman, is the boss of Tropical Resort, the first level of Sonic Colours (Wii). 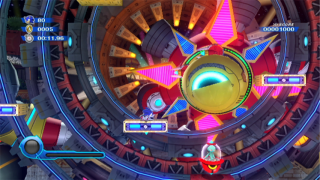 In keeping with the theme of Dr. Eggman's Amazing Interstellar Amusement Park, the foe is a giant, robotic ferris wheel! This cyclopedian monstrosity pokes its head through the center of three rings of rotating platforms, shuffling its giant, razor-sharp claws around the outer ring - also occupied by Sonic. Jump on the platforms to head towards the center - avoiding the giant ninja stars it periodically fires - and hurt the boss via a swift homing attack on his eye. It requires only three hits to finish off. The Laser Wisp is present and can make quick work of this boss if aimed correctly, as it inflicts 2 hits of damage. When the boss explodes, it releases torrents of rings which the player can pick up for a score-boost at the end of the level.